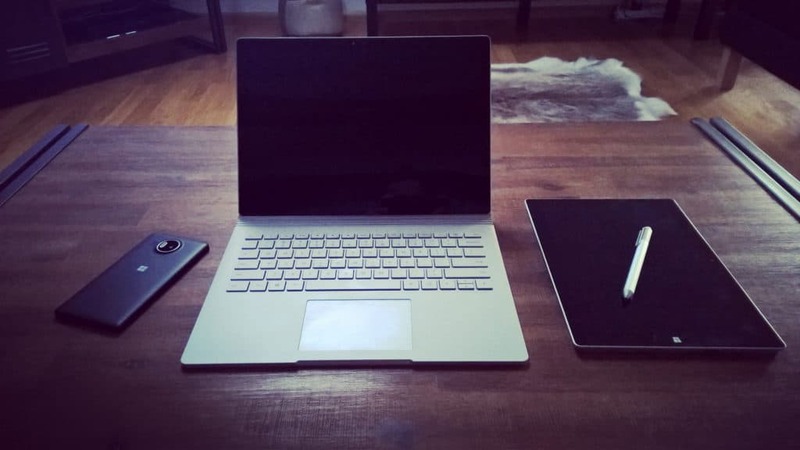 As I mentioned in my little Surface Book review a couple of days ago, I really like the Microsoft Surface Book and it is my daily driver since November 2015. The Surface Book has a lot of reasons why it is a great device, but I want to highlight some reasons why it is not only a great device for artists, but also for the IT professionals. As many of you know I am using my Surface Book for a lot of demos and also testing a lot of stuff. I run Hyper-V on my Windows 10 machine and it is extremely fast. Virtual Machines boot up in just a couple of seconds and if you for example run the new Nano Server in a Virtual Machine, the installation of a new Nano Server Virtual Machine is done in under 3 seconds. If you want to run more Virtual Machines on your device, make sure you get the 16GB RAM model. Not only do you get plenty of power with the Intel Core i5 or Core i7 chip, the NVMe SSD disk is blazing fast and can be up to 1TB. If you have a touch screen machine you just get used to use your fingers while browsing or writing stuff down in OneNote. The pen is just perfect for taking notes or doing presentations or workshops with customers. Since I got my first Surface device, I never really used a whiteboard or something like that. I just used OneNote and a projector to draw and after the meeting I could easily sent the drawings to all the attendees. I wouldn’t consider myself as a huge tablet user, but there are several scenarios where you will love the possibility to convert your Surface Pro or Surface Book into a tablet. For my job I travel a lot and I realized, I used the tablet mode a lot while for example being in a plan or train, to just read some stuff or watch movies. This is also really handy if you sit at home in front of the TV or if you are in a hotel room and just wanted to watch some Netflix, before you go to sleep. But there are two other very useful scenarios for me. The first one is while I am doing presentations for customer I use the Surface Pen a lot, but instead of sitting in front of my Surface Book, I can take the keyboard of and walk around while doing the presentation and draw on my Surface. The second one is when I am in a meeting and I want to take handwritten notes, the tablet mode is perfect, I can just use it as a piece of paper, which makes it much more attractive to write on and also I am not hiding behind a computer screen. By the way, the tablet or screen it self is extremely light so even holding it with one hand is great. Well if you are working and traveling a lot, security is a very important part. 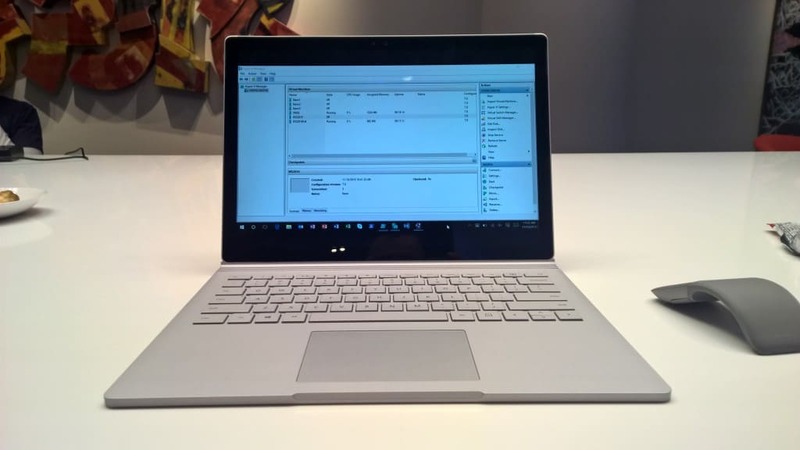 Protecting your data using the Surface Book is very easy, since it comes with a TPM 2.0 chip you can encrypt your SSD and all the data stored on. 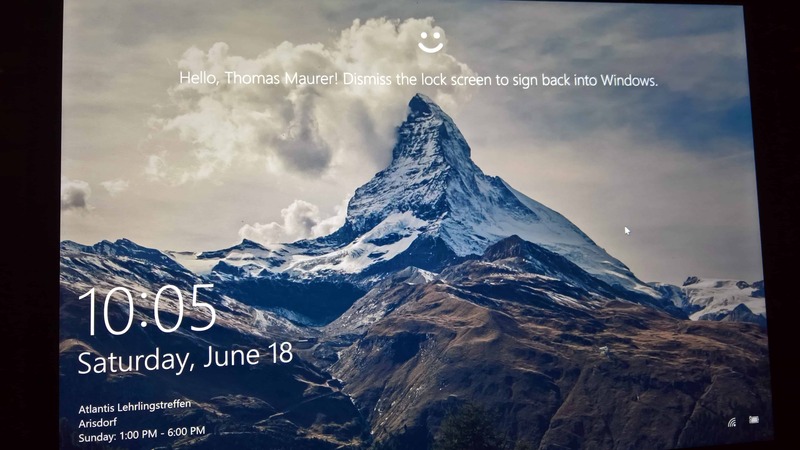 The other thing I really like is the camera supporting face detection using Windows Hello. First I thought this feature is just a nice toy, but hey, I really got used to it, I just open my Surface Book and I get logged in without typing the password. When did you get a thing and light device and you didn’t had to worry about battery life for a whole day? With the Surface Pro 3 I was very close to it, but the Surface Book finally gets me trough a whole day without the need to recharge. I get around 8-12 hours of battery life depending on the workload I am running. In the morning I can leave without a power supply and can work the whole day. This is another great feature of the Surface Book, the screen is sharp and the colors are amazing, but this is not the only reason I love the Surface Book screen. The Surface Book comes with a 13.5” PixelSense display with a 3:2 aspect ratio and a resolution of 3000 x 2000 (267 PPI). This gives you enough space on the screen to get some work done, without making the device to big. Especially the 3:2 aspect ratio is one thing I really like, especially while writing and reading. 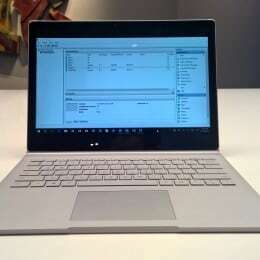 Microsoft also adds a lot of great accessories to the Surface product line. 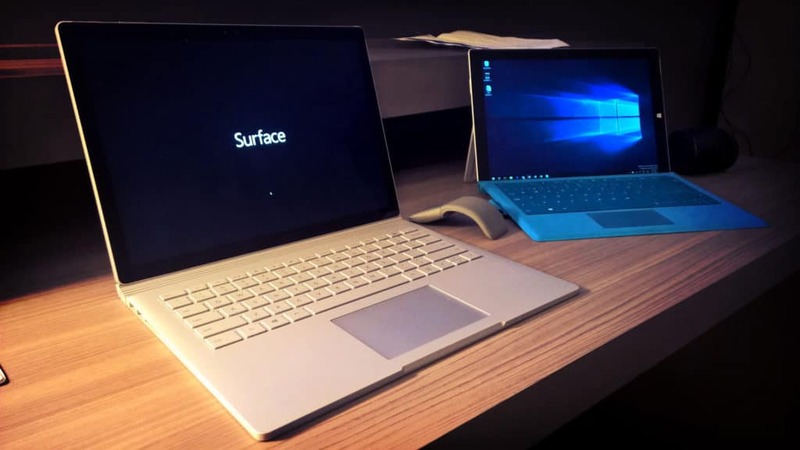 The Surface Book comes with 2 USB 3.0 ports, a full-sized SD card slot, a headset jack, a Mini DisplayPort and a Surface Connect port, which allows you to connect the power supply or the Surface Docking station. It also used the latest Wifi and Bluetooth connections to connect wirelessly to networks or devices. The Surface Book comes also with great cameras, stereo microphones and speakers which make the device great for video or voice conference calls. But also the small things you will start to like, for example the additional USB port in the power supply, which allows you to charge other devices like your smartphone or your Microsoft Band, without having to carry another charger. If I am at home or in our company office I can connect the Surface Book to the Surface Docking Station, which turns it into a full workstation. 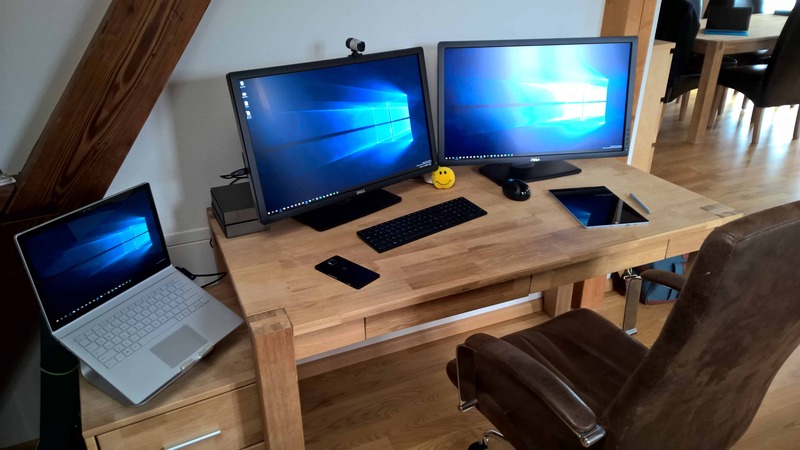 At home I use 2 Dell 27” screens using the 2 Mini DisplayPort adapters on the Surface Docking station. I also like the additional USB 3.0 ports you get with the docking station. 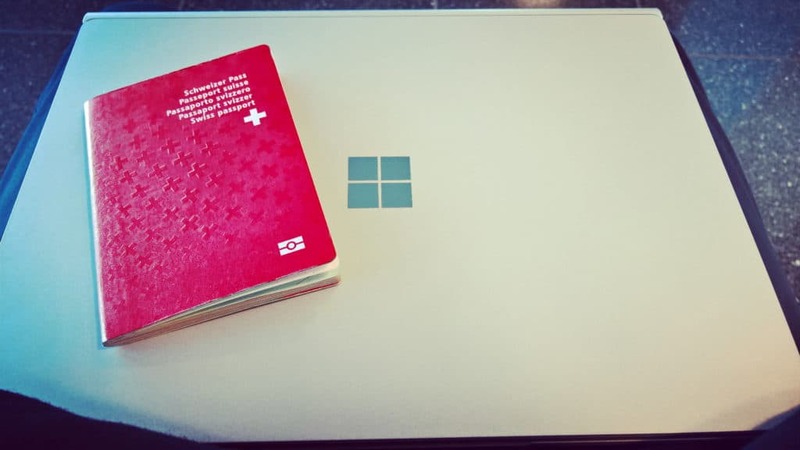 The Surface Book and also the Surface Pro are in my opinion some of the best options if you travel a lot. First the devices are light and have a small footprint, so carrying them is easy. But they still have a lot of performance to run some heavy workloads where ever you are, and with the battery life you get, even long flights or long work days are not a problem at all. But what really makes it great, you just need one device, you don’t have to carry a notebook and a tablet to have all the options, you can simply unplug the keyboard and you can go from laptop mode to tablet mode. 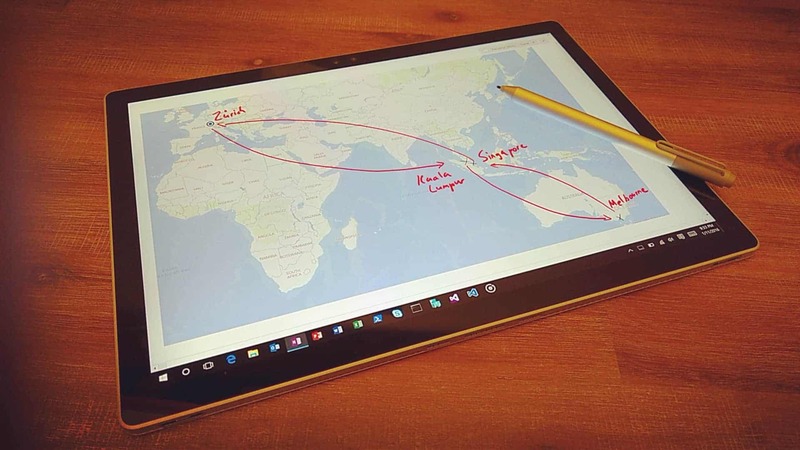 With Windows 10 owning a 2in1 or 3in1 devices makes even much more fun. 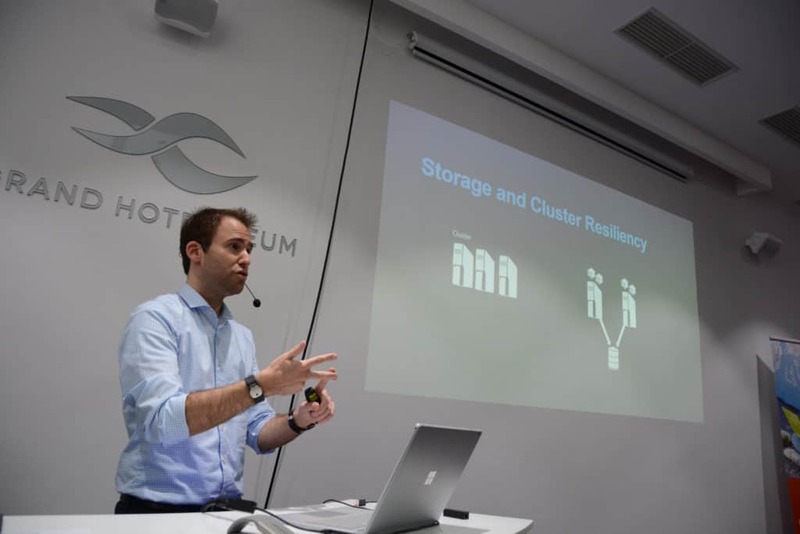 As I mentioned before, I use the Surface Book for a lot of presentations and workshops. With the Microsoft Wireless Display Adapter you can even do this wirelessly, which makes especially workshops more interactive and fun.